On August 21, 2017, a total solar eclipse will cause the shadow of the moon to traverse the U.S. from Oregon to South Carolina in just over 90 minutes causing dramatic changes in both the ionosphere and HF propagation. The Solar Eclipse QSO Party (SEQP) is a HamSCI-ARRL sponsored operating event to generate data to study ionospheric changes during the eclipse. Not a ham radio operator yet? Learn more about it from the American Radio Relay League. Final SEQP rules are available here. Initial SEQP Science Results using RBN data have been published by Frissell et al. (2018) in Geophysical Research Letters. 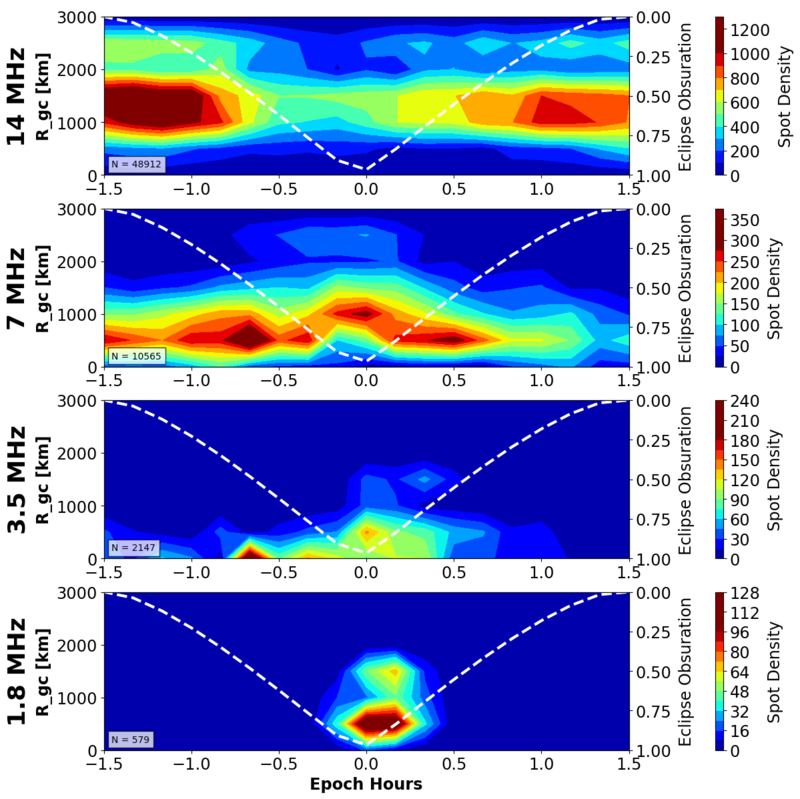 The figures below are excerpts from the paper, showing RBN spot coverage during the SEQP and propapagtion effects relative to maximum eclipse time on the 1.8, 3.5, 7, and 14 MHz bands. Additional eclipse ionospheric science presentations were given at the 2018 HamSCI Meeting at NJIT. PDFs of most presentations are available for download from the meeting agenda page. Steve Cerwin, WA5FRF, published his WWV and WWVB amplitude and frequency measurement observations of the eclipse in his September/October 2018 QEX article "Ionospheric Disturbances at Dawn, Dusk, and During the 2017 Eclipse." Reprinted with permission; September/October 2018 QEX, copyright ARRL. 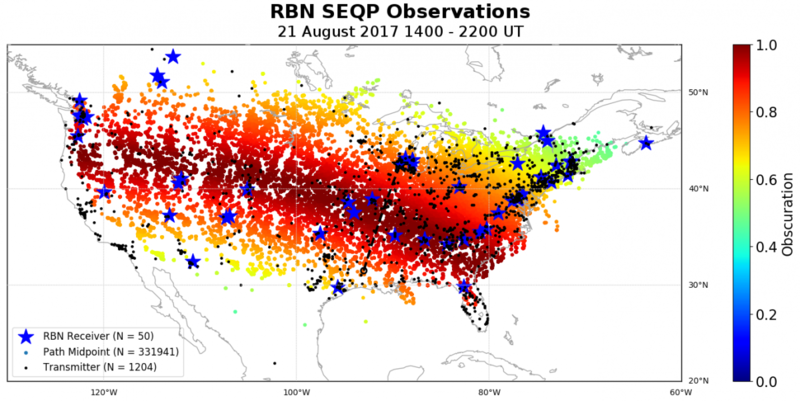 The high-time resolution geolocated RBN data with eclipse obscuration values used in the Frissell et al. (2018) GRL paper is available for download from the GRL page under "Supporting Information". SEQP submitted logs and data are available from the Zenodo archive at https://doi.org/10.5281/zenodo.2483021. Community-submitted eclipse observations are available from the HamSCI Zenodo Community Page. Python code to calculate eclipse obscuration values for arbitrary dates, times, locations, and altitudes is available from https://github.com/HamSCI/eclipse_calculator. The results are in! Congratulations to the top single operators, multi-operators, and RBN recievers. The SEQP was scored by W2NAF and K2AEM, with final write-up by N0AX. Thank you to all who participated! The SEQP was coordinated by Nathaniel Frissell, W2NAF, at the New Jersey Institute for Technology Center for Solar Terrestrial Research (NJIT-CSTR) with support from the National Science Foundation grant AGS-1552188/479505-19C75 and the NJIT-CSTR. Thanks to the many collaborators, including those at Virginia Tech, Montclair State University, the MIT Haystack Observatory, the Johns Hopkins University Applied Physics Laboratory. Special thanks to the American Radio Relay League for publicizing the SEQP and the Reverse Beacon Network and PSKReporter for extra support in data collection.